Rev. 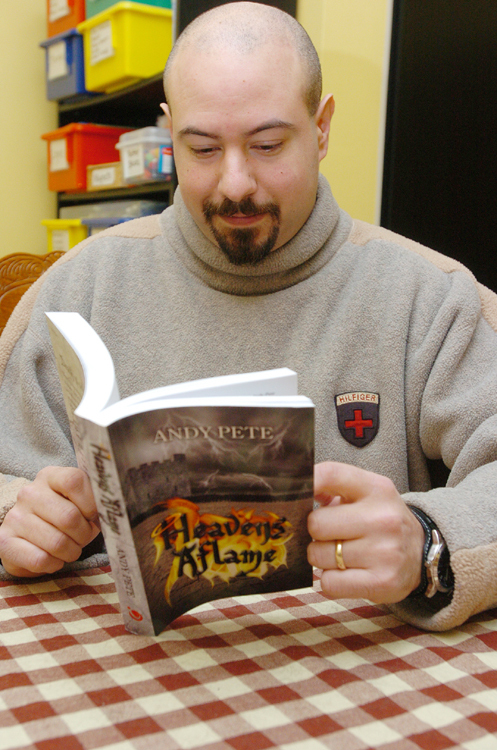 Andy Pete of Pennsylvania writes, "Heavens Aflame"
Andy Pete just may be our best recent example of what a Universal Life Church minister is truly made of. With two kids, two cats, a loving wife, family and home daycare; it would seem that Andy would have no free time. You may be surprised to find however, that Andy, whose first son was born when he was only 16, has done much more with his time than your average Joe. Andy Pete has a master’s degree in English from online Rochville University, and in addition to his ordainment with the Universal Life Church, he is a master hypnotherapist and part-time writer. Last year in fact, he invested his 2008 stimulus check into both him and his families future by publishing 3k copies of “Heavens Aflame“. The novel was written by hand during his younger son’s baseball practices. It is a fantasy which follows the life of a man trapped “somewhere between Heaven and Hell” introducing the reader to a unique outlook on life after death. Depending on the success of the novel, Pete is prepared with ideas for a sequel.